The system Rabochensckyay and the Gadiushnick (the Wiperhouse). Part first. The bad day. 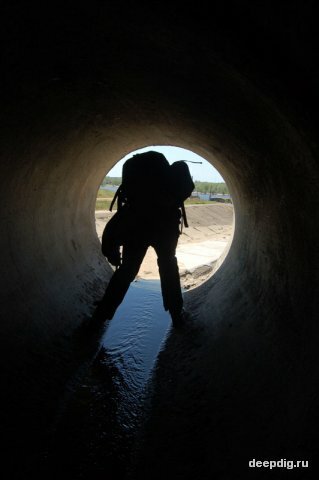 For the time being my rucksack rinsing in bath, it attempted wash clean from regular caves mud, I decided scribble at my knee one short but didactic story about like didn’t necessary misbehave under the ground, and about underground alcoholism in particular. So well - earned diggers and virtual alpinists Scamp, Uho and Urda took part in this malpractice. I wouldn’t tire my readers descriptions, that we reached, change our clothes in full view of people and penetrated inside. And here we already stood in the first sewer-hatch, 200 meters the pipe with diameter 1.6 meter was behind us; water-level was low, and I got a bottle of vermouth for celebrated. Here I permit some digression and change the subject by spirits. 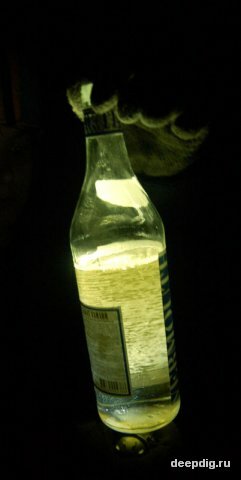 We often took drinks with ourselves in underground, especially when went in well-know places. But we took a little. Usual dose in count by beer – was one liter by person. One liter of beer stretched at several hours and against background physical loads simply created certain mood, but we don’t felt intoxications as such. In this time we has one liter of vermouth with ourselves for all three, it was just approximately standard draught. But now my «dosimeter» (the device, which measured off draught in my brains) beginning give vent to weak point. I was in low spirits, even in spite of underground’s atmosphere. Just I have such period in my life now; it is very-very bad. And here I beginning the whole of more often to drink from bottle, I stood all jovial and jovial, only my knee hurt some, which I damaged still in cave, but I almost wasn’t became apparent it painful signals in general background. And here we came in to the central room of the system. I deliberately don’t depict charm of underground world here, because this tale a little not about this. In brief all was good, evident some heavy road-building machinery worked on top, periodically all began powerful shook, and fragment of concrete fell from the ceiling. 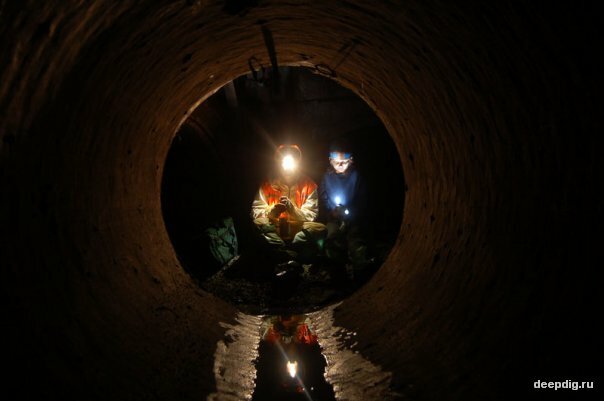 The famous Kilometrovka (it is a terribly long pipe with 120 centimeters diameters) open its greedy pharynx to the right of room, passage with 160 centimeters diameters led to the left, it has water-level exactly by edge of the top-boots. It was beginning of the Gadiushnick, which a kind of nobody passed to end. For the time we sat in the room, vermouth almost finished. And here I decided get to the shop for buying some more portions of spirits. In the beginning of the Gadiushnick was a small room, where ladder was led upward to the surface. But again in brief – we scrambled out the surface, there men made the highway, crazed workers looked at we. We briefly told about our doing here and tramped to store in a complete digger’s sets, bought there some wine and went backwards. It was incredible enjoying! If following events couldn’t be, I would write flashing version of the account! And now we climbed into the system (with resistance with worker’s party), has a drink some more wine and than get to the Gadiushnick. We walked three sewer-hatches, looked, that it was quite possible, and we decided organized detached expeditions along its passing. It was plenty of time, Urda and Uho scrambled out inside and went to their pursuits, but I decided passage the Kilometrovka alone. I set down in central hall and started took to the bottle of wine. It wasn’t dull, because I was already enough drunk man. Certainly I wasn’t reel, but fully not weak drinker. And here I started to climb. At first it was merry and lively. 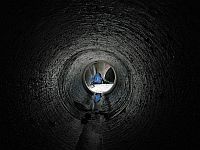 I repeat, that pipe was narrow (120 centimeters), firstly here was dry, afterwards began water with dirt, which still decreased available space. I had walk not so much bent, but huddled double up, at half-bent legs. Very vigorous loading related at waist and legs, heavy bag dangled now on one side, now from the rear. Moreover I was not weak tipsy, this brought down stamina in addition and sharply. 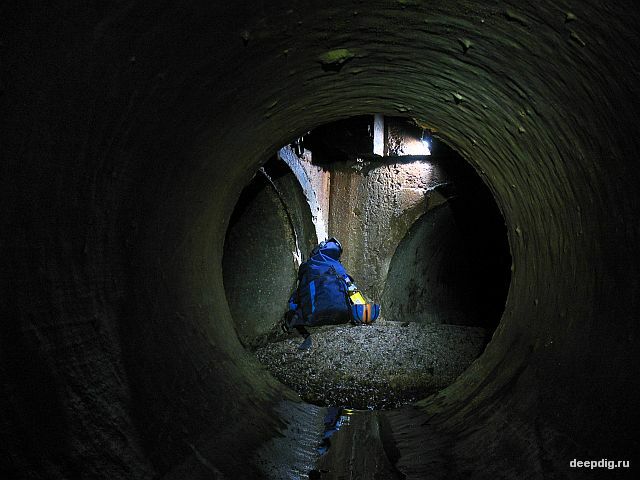 I limped to first sewer-hatch and scrambled. 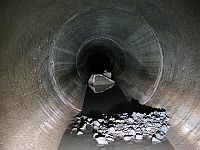 The Kilometrovka’s sewer-hatch was a 4 hoops with 3 meters in bore, then still 4 meters standard hoops with slightly less then one meter in bore. There never were ladders. I sat for five minutes there and recovered my breath. 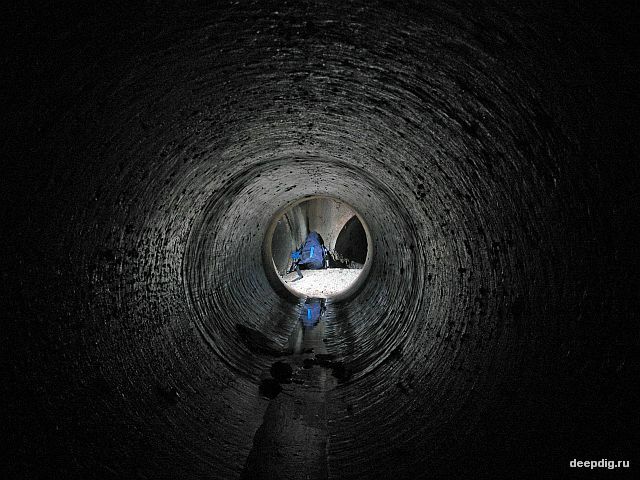 All stood seem not such gloomy; a little bit of sky was visible… And there, in this sewer-hatch I drank up all wine, which still remained quite of lot… All what happened after this lie in book-shelf “The nightmarish stories of the Scamps life“, in my memory. . Already I was in strong intoxication then scrambled down in pipe and went further. But I couldn’t go more than 30 meters at one go – very strong knee-ache added at all. And I here went/crawled/trailed along savage wrap up pose 30 meters in 5 minutes, after came to myself 5 minutes too. I reached to next sewer-hatch only just. All happens pleased me smaller and smaller. 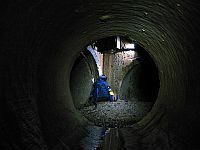 The way to next sewer-hatch was taking away subjective half an hour, after it taking away 40 minutes, and in next still the way taking away 50 minutes. 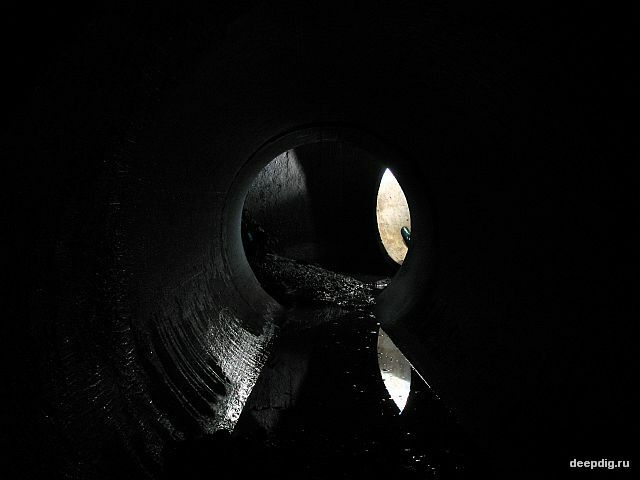 I came crawling in regular sewer-hatch in a bit beside myself status, darkness beginning in the surface, the time picked up to 8 p.m. 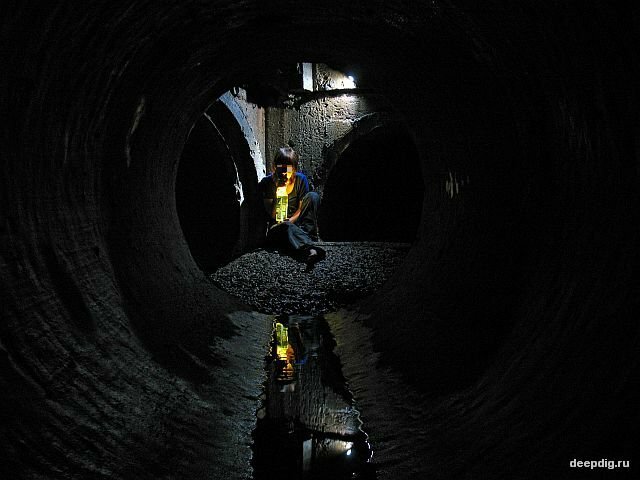 I climbed out in this sewer-hatch with enormous difficulty. I lied 10 minutes and attempted calm my breath and heart. Pain pulsated in my knee… When I recovered my breath, I caught sight of large amount any boards was here, some likeness ladder was assembling from it, but now all pulled down and rusty nails jutted out from everywhere… And I decided scrambled out here at any price! I beginning assembled some constructions, from would overcame wide 4 meters. Then I would get up in strut. I tinkered up 10 minutes and made something from boards. I beginning climb. I can’t say, what I was near of good luck, when all this rubbish crashed down under me. When I started my uncontrollable motion down, only one words «BLIN!» was born in my head, and after moment, I accumulate speed and touched down all my mass exactly in my pained knee. Blinding bright flash of pain forced out all words and shapes from all thinking layers. I began to bawl. ...I decided go forward after dozens minutes, as felt that I walked more then half of Kilometrovka. When I let down in pipe, I understood that «get forward» - was intense words. My knee hurt simply savage, and I forced crawl «in four bones» the rest of the way. I memorized the little here. I crawled roughly two hours. Layer of waters was 20-30 centimeters at the bottom, and I crept downright in it, because I haven’t choice. Firstly I tried carrying bag in back, but then beginning drag simply after myself. 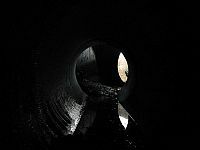 By this time I haven’t any thoughts – the least extension of leg devoted itself such violent pain in my knee, that I crept simply mechanical, I crept and crept… And I let water through. 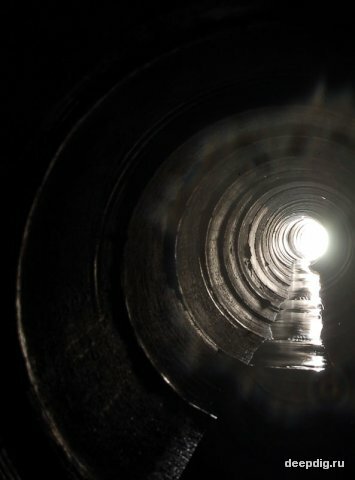 I need crept in pipe in the ending, then in ladder. This, usually simpler things was worth incredible efforts for me. And here I by man-hall cover, dangled in ladder with all my strength, in top passed boisterous route, and cars collided in the hatch roughly each 20-30 seconds. I pressed my helmet to man-hall cover; efficiency from next car shook my body. And I imagined with lively mind, as I would open man-hall cover, wheel flew to meet with me, and only jumble mixed up with debris of helmet remained from my head… But I haven’t any choice, and knock out cover with the last effort. I seemed that cars weren’t nearly. I crawled out, shielded mineshaft man-hall cover. And I almost cried from the knee-hurt, ran to the roadside, where simply fell to the ground. I lied 10 minutes there. I simply have lain, nearly in pass out. I was savage sordid, water flowed from me, better not tell, like I was dressed and as I look. Blood was oozed out my sleeve through dirt. I have time to cut myself somewhere, myself that not took notice. I lain and looked in the stars, and was very grateful, because of they was. At that time I was grateful for all world, because of it simply was, and I became it’s partly anew. This part was good-for-nothing, but it was a partly. But knee is ache and swollen till now. Do you know, how much are artificial joints today? Part second. Gadiushnick (the Wiperhouse) (very quickie). A whole three weeks had passed. I took lesson in bygone «march» and learnt it. But I wanted get in the system Rabochensckyay once more; all the more mysterious Gadiushnick hid here, which waited for its investigators. And in next rest-days I dolled up my knee and beginning worried a people. Only Urda responded to worry. We decided, that «two morons is very strong» and get in the muzzle of pipe in the Friday evening. We reached to central hall without any adventures, sat here for a while, do some artistic photo work and beginning to take Gadiushnick by storm… We reached to the room, where climbed out to bought wine at last time – light didn’t struggled from above – apparently, workers rolled asphalt in cover, that diggers not may climb out… And we get further, in obscurity, nobody went distant in this offshoot, you see. And all that bounded with it became with thick layer of legends, right up to such smallest details: spring of diggers luck lied in the end of Gadiushnick… Or connection with lower horizon of Biyk is here. 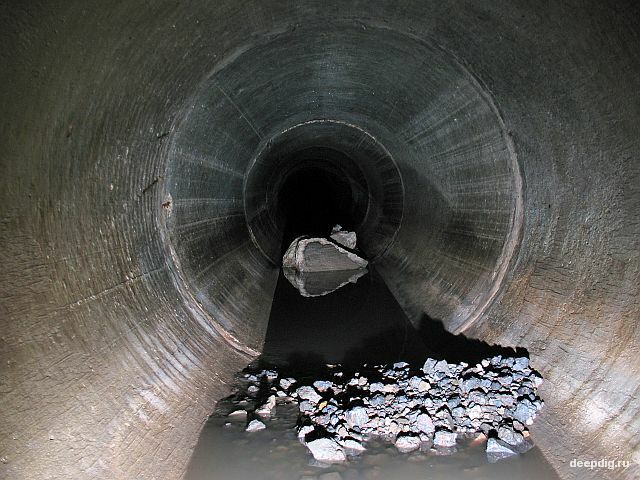 First span between sewer-hatchways was here, next second, next third… It was very hard; the pipe with diameter 160 centimeters was filling by halves in dirt. We get farther. Fourth span between sewer-hatchways was here, next fifth, next sixth… Ohhh… We beginning to be done up – sometime dirt was slightly liquidly, and in such a case we spend ten seconds and heap effort to the each step – it sucked in dirt go one better that swamp, at blessing, bottom was observed here after all. Dirt sought pull up diggers boots from our foots. Bat all was still worse in the sections, where dirt got solidly – because we must went in arch with 70-80 centimeters high (you may attempted go thus 500 meters). We wasn’t able stopped, rested, equal crept to kneel. 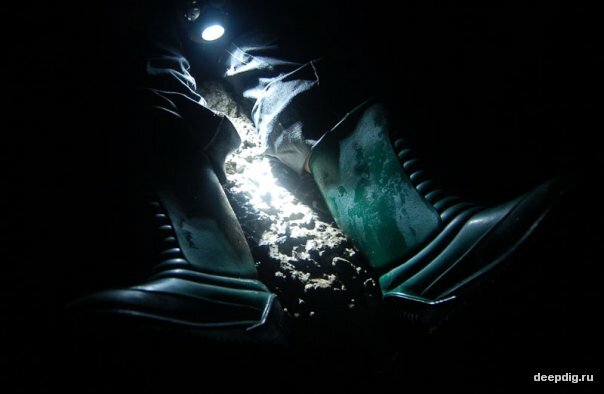 We was sucked into the more dense dirt very slow, but to the point where loyally and reliably, that we felt fear – as if we was cemented alive. So, that we flew out in the regular rooms often in the nearly beside oneself. Moreover ladders were rot everywhere, and the terrible perspective of way back loomed before us. The main argument for our retreat was gas pollution of pipe, we beginning felt effect poor mixed of methane and hydrogen sulphide to us. Way back was infernal, we drained us of all our strength to the ending, fell out in central hall, squeezed in anywhere and started rest.